Laser hair removal offers safe and permanent reduction of unwanted hair with a procedure that is much more comfortable than traditional methods such as electrolysis and waxing. Imagine not having to shave, pluck or wax. At Eshaan, we use state-of-the-art laser technology to quickly and effectively remove hair on nearly all areas of the body. Our laser technicians are medical professionals and all procedures are FDA approved. In keeping with the Eshaan standard of excellence, discretion, guest safety and guest satisfaction are of the utmost importance. For men and women with unwanted hair, there is a new hassle-free solution. Laser hair removal is safe and effective treatment that results in a sleeker, hair-free appearance. In the past, the remedies for unwanted hair included shaving, waxing, tweezing, electrolysis and depilatory use. Some were painful, some were messy, and all were temporary answers to a never-ending battle. Not all lasers are created equal. Eshaan is pleased to offer the gold standards in laser hair removal technology. The LightSheer™ and ELaser™ diode lasers provide non-invasive and long-lasting solutions for unwanted hair. Both lasers isolate a wavelength of light from 800nm to 810nm. This wavelength is optimal for targeting melanin to destroy hair follicles, but is well tolerated by a variety of skin types. Other lasers that do not utilize this wavelength may provide spa goers with poor results. Using only the best technology allows Eshaan to effectively treat unwanted hair on all body parts for a wide variety of skin types, including ethnic complexions. Moreover, LightSheer™ and ELaser™ laser hair removal has been proven to create a permanent reduction in the number of regrowing hairs following each treatment. The LightSheer™ and ELaser™ lasers gently cool the surface of the skin while pulses of light (and radio frequency for the ELaser™) are selectively absorbed by the melanin (pigment) in the hair follicles. The absorbed energy heats the hair structures, which damages the existing hair and destroys the regrowth potential of the follicle – all without damaging the surrounding normal tissue. If the hair does return, it usually comes back lighter and less dense. The growth cycle of a hair has three stages. The energy from the laser has the most significant impact on a follicles ability to regrow during the active or Anagen phase. Unfortunately, hair follicles are typically in different stages than other follicles at any given time. In order to treat each follicle during the Anagen phase, a series of treatments is usually required. Skin and hair color, hair texture, growth density, and energy tolerance also determine the number of treatments that may be needed. Each individual responds differently to treatment, however, the average person receives 6 to 8 treatments. Clinical studies for the LightSheer™ and ELaser™ lasers have shown that patients on average obtain end results with less treatments than what is required from other lasers. 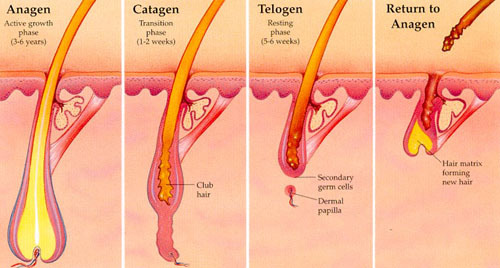 Growth cycle of a hair has three stages.